This week’s review of blog postings and news stories of note focuses on subjects that might seem trivial, but that interest me nonetheless. My brother and I had an extensive collection of comic books when we were growing up. We even owned two (two!) mint editions of Conan the Barbarian number 1. If I still owned that collection today, it would easily pay for the first year of my daughter’s college tuition. After reaching the age of puberty, I consigned my childhood love of comic books to the “trivial” category of youthful pursuits. Perhaps that is why I was so delighted to read about the current exhibit at the Lillian Goldman Law Library at Yale University, entitled Superheroes in Court! 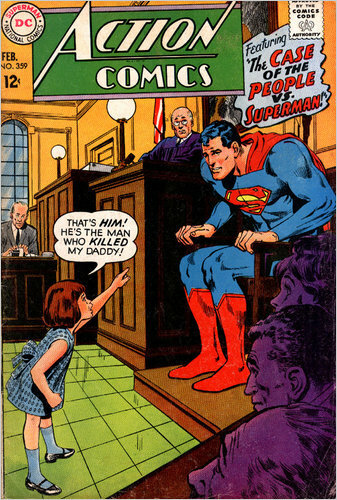 Lawyers, Law and Comic Books. As described by John Schwartz in the New York Times, this exhibit includes comic books with a legal setting, contracts and correspondence relating to legal disputes over the ownership of comic book characters, and reports submitted to Congress during the 1950s seeking federal legislation to address the alleged connection between comic books and juvenile delinquency. I am well known among first year law students for my advice to maximize their study time by giving up trivial pursuits such as televised sports. Professional football games, in particular, can eat up a lot of time that might be better devoted to the study of law. For those students who refuse to give up their football, but who would like to pretend that watching the game advances their studies, Aurelia Schultz at The 1709 Blog has a good post on the copyright infringement case arising out of the original logo used on the Baltimore Ravens helmet. It seems that Frederick Bouchat designed the logo for the expansion team-Ravens back in 1995, which originally consisted of the letter “B” with two flying wings attached. The Ravens used the logo but paid Bouchat nothing. After a first round of litigation resulted in a finding of copyright infringement by the Ravens, but concluded that Bouchart was not entitled to any damages, Bouchart and his lawyers embarked on a series of increasingly creative lawsuits filed against anyone and everyone who ever licensed or used the logo. Meanwhile, the Ravens abandoned the original logo in favor of today’s depiction of a raven’s head with the letter “B” inside. Finally, ten years after the original suit, Boachat’s serial litigation may be about to pay off. It seems that the Ravens and the NFL assembled and offered for sale a highlight reel of Ravens football games that included footage of games where the team was wearing helmets with the old logo. Bouchat sued for copyright infringement, and the United States Court of Appeals for the Fourth Circuit recently ruled in Bouchat’s favor. The court rejected the Ravens’ argument that the highlight reel fell within the “fair use” exception to the copyright law, primarily because the sale of the highlight reel had a commercial purpose and because the game footage used in the film depicted the entire copyrighted work in the context of its original purpose (identifying which players were on which team). The court noted that the fair use doctrine might have applied if there had been an attempt to transform the copyrighted work for a different purpose (i.e., using the footage for a documentary on the topic of the legal dispute over the original logo). Law students now have my permission to watch Baltimore Ravens games all season long in order to observe the practical application of the laws governing intellectual property. What could be more trivial than playing video games? The news that a man sued the software manufacturer NCsoft over the game Lineage II, claiming that he became addicted to role playing video games, was met with derision by many observers. Addiction of any kind is a serious matter, and should not be laughed off. A thoughtful and sympathetic response to the lawsuit can be found on the blog In Third Person. While doubting the legal merits of the plaintiff’s claim, the author of the post (a self-proclaimed “20 year gamer”) points out the important distinction between substance addiction and behavioral addiction. This distinction is not trivial, and it may ultimately limit the legal liability of the software company. It seems that there is a broader game going on, over the proper way to interpret contracts. Besides video games, there is another type of trivial pursuit common among first year law students. At some point in their legal studies, they begin to notice all of the torts, both real and potential, that are taking place all around them every day. At this stage, every law student who is cut off by another driver in traffic or else jostled in a crowded bus seems compelled to share their observations about the various breaches of duties and intentional torts that have just occured with all of their non-law student friends and family who happen to be in the vicinity. It is actually quite annoying. Medical students do the same thing, and anyone who has known a doctor in training has been on the receiving end of multiple unsolicited diagnoses and treatment options. The explosion of YouTube and cell phone video recorders makes it easier to play this game than ever before. No longer are you limited to postulating the legal consequences of the various torts that you observe first hand. Now everyone can cruise the internet and debate the theories of liability that flow from conduct captured for posterity on the internet. For example, over at Sports Law Blog, Michael McCann of the Vermont Law School has posted the video of a brawl that erupted in the stands at the U.S. Open. What follows is a discussion of the possible legal aftermath of what is depicted on the video. It’s a fun way to waste a few minutes and work your brain cells at the same time. Next Next post: How Did This Milwaukee House Change Property Law?